I Love my 3rd Published Novel! In summer of 2016, the third and final installment of my ‘Historical,’ & not sci-fi, EPIC called the ‘TRAYLOGY’ will be published by TWB Press in Colorado. 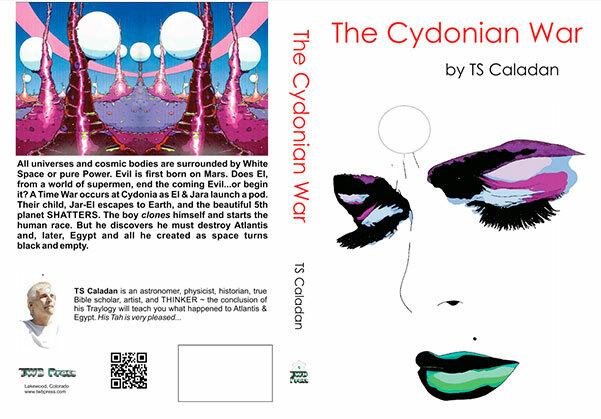 I am proud to announce the publication of The White Book or real-world prequel called “The Cydonian War” that follows a new origin for the human race. Are we displaced Martians? Did we ruin Mars, turn it red with radiation, shatter the Fifth (gap) Planet and then begin an Eden Paradise on Earth known as Atlantis? Was later Egypt ‘Little Atlantis,’ doomed to repeat the same tragic events from earlier cycles? Did everything created by prehistoric Indians on Earth have originated from a far greater Empire on Mars? What would that Super World have been like and what might have happened? The Cydonian War illustrates in vivid details, with wild ‘poetic license,’ a story akin to the Superman story of a special child sent to another world. Or does it really parallel the story of Nikola Tesla sent to Earth from the planet Venus? Parts have also been borrowed from Dune and the Maud’Dib, Luke Skywalker, Mr. Spock, Bilbo, Frodo, Neo in ‘The Matrix’ as well as Jesus Christ (not a character). Truth is…here was a wonderful vehicle or ‘delivery system’ to present conclusions from more than 40 years of research into ancient mysteries. Book #3 goes back in time to the very ‘Beginning’ when Space or space between celestial bodies was WHITE; useable Energy was everywhere and powered everything! What turned one universe of Infinite White Worlds BLACK? How did Evil, darkness, pain, destruction and Death FIRST come to exist and destroy the perfection in countless solar systems of what became a single and the only Black Space universe? How was Mars ruined for a million years and what shattered the Fifth Planet and formed craters, the Asteroid Belt, Kuiper Belt and shooting stars? …Took on the burden of FIXING a corrupted universe…only to discover that they were the CAUSE of the seeds of Evil and Darkness to sprout on Mars in the first place. Does the third book in the Traylogy portray a reasonable possibility why Mars is known for the “God of War”? Spiritualism is a huge theme in the Traylogy. In Book #1, wife was killed by her evil twin and the ‘deceased’ (spirit) possessed her killer! In Book #2, father became the son by Act 3. 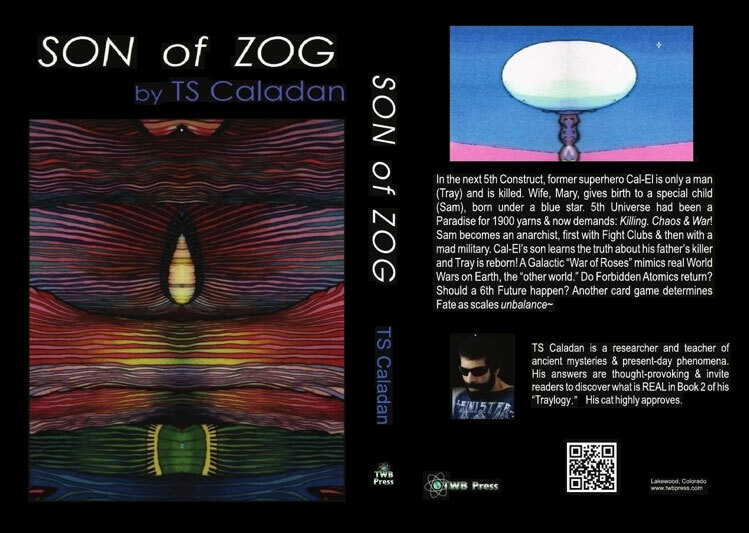 On a much larger level, in Book #3, Son became the Father in a Cydonian ‘TIME WAR.’ Reality or Time folded in on itself and gave a rare opportunity for another chance to get things right! In Book #1, readers find that the real world of the Earth and its universe was destroyed around 6000 BC. All History after the warrior race of hi-tech Toltec Indians (devolved Egyptians)…DID NOT EXIST~ Nothing in the real sense existed because of how crucial the Nexus of our First Universe, the First Solar System and the First Planet: Earth. Higher Life throughout the Mega-Universe [Watchers & Listeners] paid very close attention and monitored this ‘rogue’ World where protons (planets) were suddenly charged negatively and turned into ‘electrons.’ Would other Big Bang Universes go negative and become DARK? Will the Ultimate Game be won by the good guys? Will the Caladans, in two dream worlds and a real one, win in the end? Will Son redeem the sins of the Father, erase passed mistakes, fix the Universe one more time and turn Power back on a lone, empty, blackened universe? The DC World will no longer continue one way, from the cosmic top to the cosmic bottom. The Universe will be made to Alternate. All will change; the World will flip and a wave will feedback to the Source! There will be Cycles and repetition and days and nights and cold pain and…and…DEATH! …the Voice conveyed the exact name of the entity that will bring Hell to Heaven, interrupt the Great Power flow and bring Darkness to the World of Light. His name was…El. We do not have to worry about Ra (Sun) being green, Jar. We have to worry when it turns yellow. You are at a Machine…there is a war…in time. What Machine? What is war? The tears were the first tears ever shed. You mix dreams with reality, Old Man. El will destroy the very Universe he is trying to save! It was YOU all along that will bring on the Night. El bled blue blood on the green planet. Gan’s Ghost was the first Spirit that remote-viewed without a user…It viewed exactly what was going to happen to Lilith in the future. It had seen The Dark. 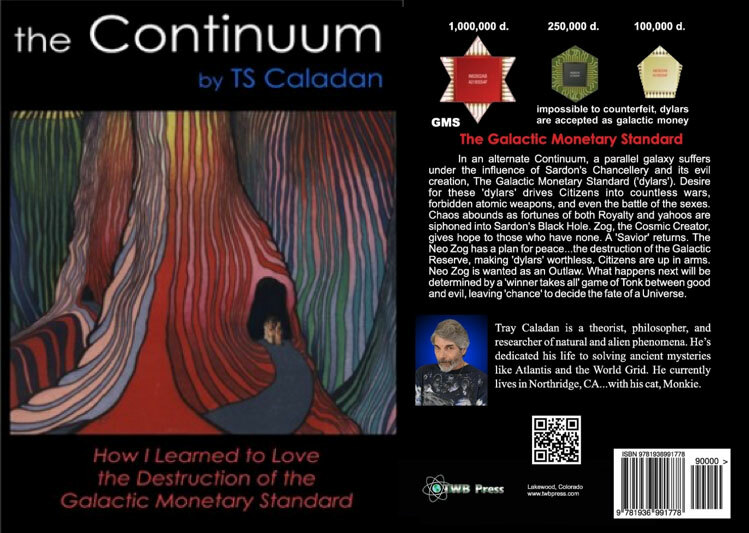 The constant, eternal stasis-bubble of protection and entire planet were going to explode! Evil had arrived and white space was now BLACK. I am a Tah, Madam. It’s wonderful to meet you. The mental voice of the ‘animal’ [lion] boomed in a deep and low tone, calm and relaxed. It radiated love and warmth and regal confidence…I could come in handy, Madam. Sir, why can’t I remove his head? Tah’s beautiful teeth gleamed and made sure Jaq did not escape. El’s plan was while Bel constructed a Weapon of Mass Destruction (‘Big Gun’) at Cydonia out of a once Life-giving, Energy Fountain or Grand Pyramid…The minds of 4000 Sons of El, collectively, should be able to physically move the metropolises to safety (inside giant Fruit). One small network of the Universe was on fire. The gods made war. The husband never knew his wife had company and did one of the most compassionate acts that had ever occurred in the universe. White Atomics only obliterated the Latinimide (stalk), not the Crystal Fruit. Orkhan City-Crystal did not fall! Its Xima stalk was gone. The beautiful, yellow-lit orb remained suspended. A surreal dream did not support the 7½-mile long City Sphere in the air. The Fruit was kept in place exactly 51 miles over Shasheer (Mars) by the combined effort of 4000 focused minds. How long can 4000 minds hold a 7-mile City suspended high in the air? The fine beam ‘popped’ a protective bubble around Lilith and then followed through at the precise point that most efficiently shattered the 5th Planet into shards no larger than 600 miles in diameter! Not only were the last good and pure beings (Sons) ‘killed’ in the material world, so were ALL Spirit-isos with the unthinkable and inconceivable destruction of ghostly Lilith. Could every atomic particle of negativity be switched to its positive opposition (or never have happened in the first place) by a simple turned Key? The power generated by a 5-sided Lens the size of the Grand Pyramid of Shasheer was far more than calculated by Bel scientists. In precisely 27 minutes, a flashback or feedback, reflection-force or bounce-effect ‘recoil’ from obliterated Ra-5 will ‘wave back’ and demolish Shasheer! Death had become the new reality. The Manuel tried to understand. I did not…create women? The Man had never viewed a work of art as beautiful as the Woman. Tera grid wasn’t designed to hold and handle anything over 50 million citizens…even 50 million user-gods might be tearing at each other’s throats with the obvious ‘energy crisis’ these numbers will create. Variable-isos. We never dreamed of such numbers, dear. What happened to a small World’s Fair planet? Still does not look like me. But it was not little spirit: it was the Mystery of Mang and ‘thorn’ of the rose inside a 7-year old child. In the past, Terans accessed fantastic, important, scientific, technical data, but that was not the case in the present. Today the masses accessed each other, primarily, and not large libraries of data. At the touch of a button, on small devices they carried, the masses essentially ‘chatted’ and not much crucial information was relayed. Where one of your Sons came from Rael (Venus)…as an infant in a ship sent by loving parents, sounds like you dear, and created a New Age of Electrical Wonder and quantum leaped humanity, accelerated society back up into the peaceful and beautiful creatures we were in the Beginning. The future is either very good or very bad, huh? Were clones people with rights or were they merely property? Tera’s leader and society’s ‘builder’ lay prone on the scorched flatland of TB1 ruins right in front of his favorite spot: his ode to the Sun and to the Creator, the once great Gate of Ra. The mark. He showed her his left arm. Only the tiniest hint of a blemish remained of where the Teran human race originated from. Even with a new body, it remains. It was the mark from the original DNA scraping which materialized the very first clones and the colony. Every bit of hell unleashed upon Tera…genetically came from his left arm. The man held an n-ray tool in his right-hand. He aimed it at the proper angle and pressed the on button. A fine, red laser vaporized a small area directly under the right eye of the ‘flying god’ sculpture over the stone arch. 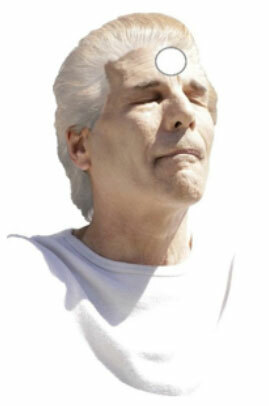 He carved a ‘tear’ indentation as a real tear formed in his right eye. They made love in the rain. What are we without souls? What are we without our dreams? 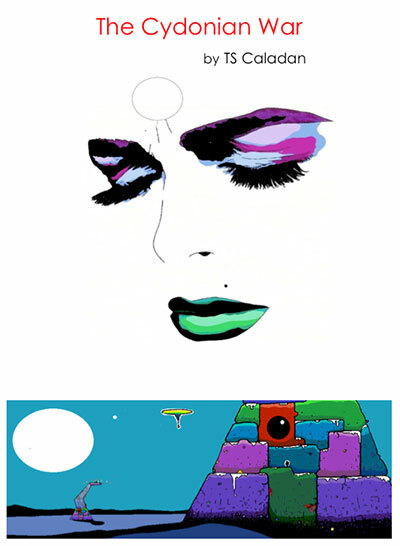 The pure and pretty Spirit-isos needed the real planet intact to exist in surreal dreams. Shasheeran smooth ‘shells’ were not floated among the ‘asteroids’ or were continued to be ‘driven.’ The Age of Dreaming was over for a black, microscopic network that was an ‘abomination’ in the Grand Scheme of Beautiful Things everywhere else. The oddity was that a single exception sustained an existence or type of existence. The undeniable truth was that a unique Ghost which had a name (touched by Jara of El House) was not dead. Gan’s Ghost or ‘Gan’ was always a bit different. GG was now extremely different than her deceased Spirits. Real Gan, the old ex-Counselor, was also not dead. In fact, she was ALIVE in the real world of the Ra Solar System. She remained in black space. The shock wave and lethal, plasmic radiation from the Cydonian Event did not damage her, physically. 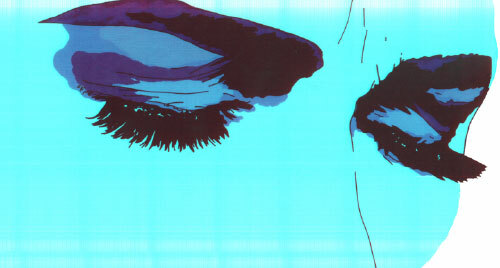 Did she ‘phase-into’ an incorporeal one, her Ghost, and had escaped its deadly effects? Another odd sequence of events happened within the (6th) dimension: Spirit of the Madam El or Lady Jara of El, ‘poured’ into the physical ex-Counselor. Gan became ‘possessed’ by the wife of her sharpest adversary. When Jara’s soul controlled Gan, she was asked to ‘pour into her original Ghost,’ the Spirit-vessel that was never used by her user. Gan was not the stubborn realist as before and agreed. She was softly urged by the Lady El and was now blissfully poured inside her original Ghost. Gan’s Ghost was touched, poured and fully filled by her Ra-4 user for the first time. The Spirit cried real tears. Ecstasy was the feeling for all three ladies: Jara, Gan and the happy golem Ghost-iso. Truth also resulted from the female triad. Real Gan was in black space and with the power of ‘3,’ slipped through the barriers of Time and the force-field lock around the Pendrax Tesseract at Cydonia. Gan, along with ‘company,’ materialized inside the King’s Chamber minutes before the Hyper-Universis-Moment! A loud roar was heard from Tah’s Ghost. WRITE TO AUTHOR FOR INFORMATION ON PURCHASING SIGNED AND NUMBERED COPIES OF TRAYLOGY. Find out how you can receive a FREE copy of the final book: “The Cydonian War.” [E-Books also available thru TWB Press]. Final words: …a lifelong dream was achieved. The books were not the new “Chariots of the Gods?” I had imagined in my youth. But they turned into the “New Chariots.” It was a way to produce theoretical art and call it ‘fiction’…while knowing full well that a bit of the story was true. I try not to insult the intelligence of readers. My stories are puzzles for viewers to see pictures I’ve seen in my mind and then figure what the Stream of Consciousness meant or what actual, real-world things I’ve written about. Book #2 was completed in 5 weeks! Book #3 was written in 4 weeks! It was Automatic Writing, done every day at an extreme rate of speed. Characters were ‘let go’ and, in mental images, they acted their parts and I reported what I saw. Ends of scenes and connections to subplots and to other books of the Traylogy weren’t planned. They just about occurred at the time of writing when ‘in a zone’ and typing away at a furious pace. I don’t have an end until I get there! The experience of writing is so much more enjoyable this way: to NOT KNOW. You become a ‘movie-goer’ in a theater and you watch the Play unfold on a colorful stage before your eyes for the first time, unaware of what is to come. It’s fun. It happens. It’s exploring. It’s better than you imagined and was almost like (looking back) I didn’t write it. 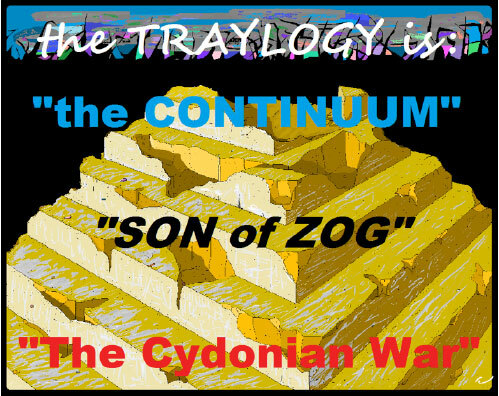 Traylogy is the soap opera of the Caladan Family (no relation to water-planet and home of House Atreides in ‘Dune’) through two dream worlds and a real one. [I couldn’t have named myself after a better family]. Forty-five years of scientific research, work and conclusions as well as Inspiration and Realization on our mysterious past have been incorporated inside the 3 books. #1 is a somewhat larger parallel to recent times while #2 [in flashbacks] and #3 reveal a unique origin story for human life on Earth from Mars. My efforts over decades in one medium or another have attempted to show a complex truth to History or the Atlantis hi-tech Paradise, its fall and extended Aftermath (Indian Cycles) with help from the wireless/electrical work of Nikola Tesla. Yes, you can understand the ancient past [anti-gravity pyramid-building, etc.] from Egypt to Maya by studying the Future or Sci-Fi. Why do our Cradles of Civilization such as Giza/Egypt, Andes (Incas), Stonehenge, Easter Is. and 9 more form a World Grid pattern around Earth? Because they were once connected in an EM Power System: a network of a prime Station and 12 substations. The distant past has been presented wrong, backwards and lame compared to fantastic empires of long ago. If we truly understood Atlanteans and Egyptians, we just might make a connection with their far more advanced (possible) predecessors on Mars. Do ruins at Cydonia and the myth of the ‘God of War’ connect with ruination of the Red Planet and destruction of the fifth planet? Why not base a story around possible events that preceded and superseded the SHATTERING of the 5th Planet in the gap? White Space was an incredible thought: a realm of reversed polarity completely opposite from our great Void of a virtually empty universe. Why not weave a story around Heavenly Universal Energy and its ultimate breakup to explain the ‘Hell of physical Life’ and ‘blown fuse’ Evil in this cold, dark world? Strange parallels between Ray Douglas Bradbury’s “The Martian Chronicles” & my “The Cydonian War,” only found today: 5/17/16. Both Ray and Tray were named after film actor: Douglas Fairbanks. Tecknowledge locations effects for whom world. There’s a bit more, if you can handle it? Star Wars (according to Lucas) is a soap opera of the Skywalker Family…& mine is the story of the Caladan Family. I took on the name ‘Caladan.’ In writing the Wikipedia, I looked again at my daughter’s original name: Rose Elizabeth Yurchey…REY…..like the young girl’s name in the new Star Wars who is Luke Skywalker’s daughter…another parallel? R.E.Y…..daughter of Caladan? I’ve always agreed with Edgar Cayce, Ignatius Donnelly & many, many others, which include Plato, that Incas and Egyptians had a greater, mother-culture in Atlantic area called ATLANTIS. It would have dwarfed anything that Pre-Incas, Pre-Egyptians or Super-Indians would have created and built. Now let’s go a step farther…to a place millions of miles away: the ruined Red Planet and fantastic structures that have been found there to date [what have we not seen?]. Bottom line is: CYDONIA, Mars structures: Pyramid, Face, tholis, etc, etc…ask Richard Hoagland and he’ll tell you and show you amazing, gigantic structures…they stand, they are physical ruins maybe a million years old and they strangely resemble Giza, Egypt! Did the Martian Face function as our Sphinx functioned? But the Mars Metropolis at Cydonia is much LARGER in size than the Egyptian empire…just as Egypt may not have been anything the Size and Power of what was once on the (sunken) continent of Atlantis. And Atlantis was probably far inferior than much earlier on home world, Mars… A similarity in constructions seems to connect these ancient empires. Thank you for THE ANNOUNCEMENT! I wanted to appear different in photos for each book. In #2, the galaxy goes to the Dark Side & so does the ‘Child of Destiny’ & author’s photo. But in #3, White Book, the photo is of the Light Side. How can the prequel be the final resolution? Maybe that’s where the Time War comes in~ Everything on the covers mean something: blue in background of 1st photo & 1st by-line. The italics in #2’s title refers to the rebellious child & skewed society. Colors (red & black) of #3’s title & by-line refer to the War to come while a beautiful Woman in White cringes seeing the Dark Future ahead. Readers of World-Mysteries know my long history/obsession with Atlantis & pyramids. I think the “Traylogy” is a marvelous way to Spark Minds. Good luck TRAY and W-M and others.Controversy and intrigued analysis of our property,Either spells success or failure but never defeat.I give consent on the grounds of fair play and respect for the elders ancient knowledge.Sorry this dialogue doesn’t have email account.Only here is the mystery. A very lonely mystery indeed. I think we are being attacked.